Adjustable trailer receiver hitch designed for use on RVs can be bolted to the vehicle frame or welded on for a no-drill application. Powder coated steel is sturdy and corrosion resistant. Lowest Prices for the best rv and camper hitch from Curt. 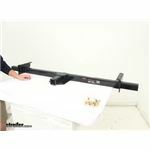 Adjustable Width Trailer Hitch Receiver for RVs, 22" to 68-1/2" Wide part number C13704 can be ordered online at etrailer.com or call 800-298-8924 for expert service. Overall length of receiver tube including crossbar: 11"
Distance from front of crossbar to front of receiver tube: 8-3/16"
All non-trailer loads (bike racks, cargo carriers, etc.) applied to this product must be supported by auxiliary stabilizing straps. For use with RV-approved accessories only. 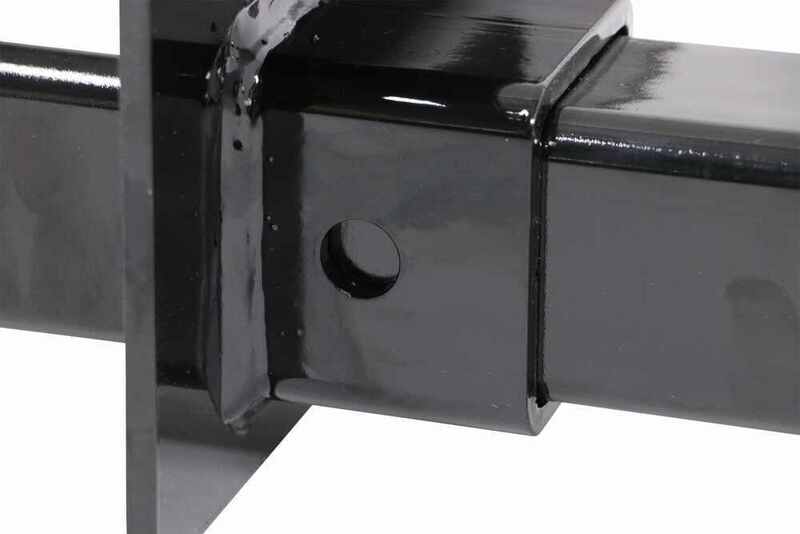 The main hitch body tube can be trimmed so the ends are flush with the frame brackets. After trimming, coat the bare metal with paint to protect against rust and corrosion. 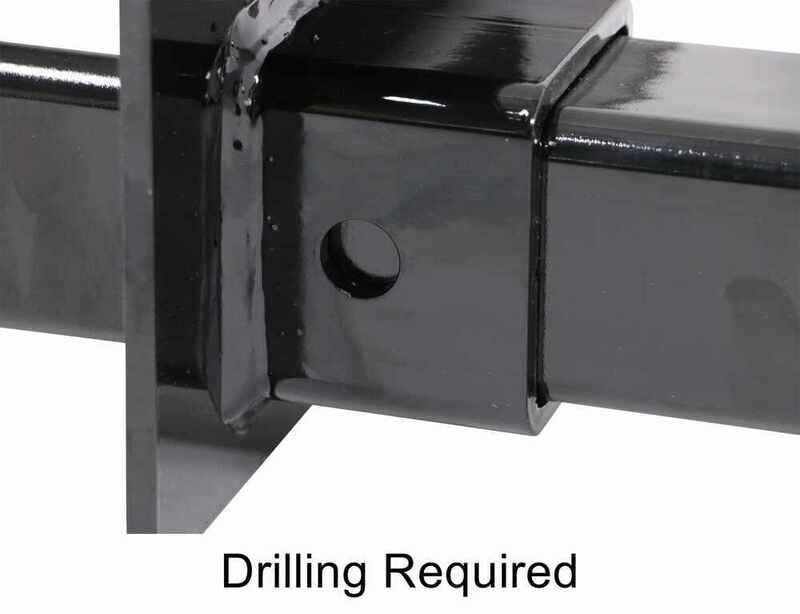 If welding this hitch, all welding surfaces must be cleaned to bare metal or the weld will not be the required strength and may void the warranty. Speaker 1: Today we're taking a look at the Adjustable Width Trailer Hitch Receiver for RVs. This hitch is from Curt Manufacturing. This unit is a universal design and it's been designed for use on RVs and motor homes. It features these heavy-duty side brackets that allow for maximum adjustability, so these can slide along the main tube.You have an adjustable width measurement of anywhere down to 22" out to 72", so a lot of adjustment with this system. Other hitches like this are usually weld on installations. This is a bolt on installation and it comes with all the necessary hardware you need to get it installed.But these do slide along the hitch body to match the width of your vehicle frame. It works on box frame, C-channel frame, or I-beam frames. Again, hardware is included. It comes with detailed installation instructions to walk you through that whole process step-by-step.We're looking at a really nice durable steel construction. The unit features a 2" by 2" opening, so it's going to work with 2" by 2" accessories that are designed to be installed in a hitch. The pin holes will accept a standard 5/8" diameter hitch pin or hitch lock, and then you have the connection points right here, one on each side. These are just holes that go through this plate, and that's the connection point for like a safety chain or an anchor strap or security strap if you're using this for an accessory.On that steel construction we have a high-gloss black powder coated finish. It does a great job at resisting rust and corrosion. It protects the hitch and helps it look good for a long time. We're looking at a strong, secure all frame attachment and a really nice solid steel construction for maximum strength and safety. Just keep in mind that this not for use with a weight distribution system.Again, your receiver opening is 2" by 2". It features a Class 3 rating. The sticker, located right here, has all the capacities on it, so the maximum gross trailer weight rating is 3,500 pounds, maximum tongue weight capacity is 350 pounds, and the straight line pull is a 9,000 pound capacity with this hitch.Again, it fits frame widths of 22" to 72". The brackets . What I'm talking about are these right here. So these brackets edge-to-edge measures 10". Outer edge to the curve right here is about 1-3/4 to 1-7/8". The mount holes are separated on center by 8-5/8".Curt also covers this hitch with a limited lifetime warranty. That's going to do it for today's look at the Curt Adjustable Width Trailer Hitch Receiver for motor homes and RVs. Order: RelevanceNewestRating - High to LowRating - Low to High Adjustable trailer receiver hitch designed for use on RVs can be bolted to the vehicle frame or welded on for a no-drill application. Powder coated steel is sturdy and corrosion resistant. For your 2017 Winnebago Winnie Drop 170S travel trailer, I recommend using the Curt Adjustable Width Trailer Hitch Receiver for RVs, 22" to 68-1/2" Wide # C13704. This will give you the ability to bolt the receiver to your Winnebago travel trailer frame and then you can use a cargo carrier like # H01472 for your large cooler. I've linked the page to all our Cargo Carrier options to assist. I attached two picture for the Curt hitch part # C13704 that have all of the dimensions on it. I believe you also asked for the distance from the crosstube to the front of the mounting bracket. Which if so, that distance is 2 inches. The third picture is the dimensions of the # 13703. The Curt Adjustable Width Trailer Hitch Receiver # C13704 referenced in your question features a 5,000 pound towing weight capacity and a 500 pound tongue weight limit. I verified this with Curt. This adjustable hitch is designed for use on trailer or RVs and will work on frame widths of 22 to 68-1/2 inches. I have attached a short video review that you can check out as well. The Adjustable Width Trailer Hitch Receiver part # C13704 is rated for 500 lbs of tongue weight and 5,000 lbs gross trailer weight. I checked with Curt to confirm this for you. Please note that if you are using this trailer hitch for anything other than to tow a trailer you will also need to use the Curt Cam Buckle Stabilizing Strap part # 18050. We have the Curt adjustable trailer hitch part # C13704 which can fit frame widths between 22 and 72 inches as well as has a 350 lb tongue weight capacity. As long as your trailer has box frame, C-channel frame, or I-beam frame this will fit and work well. I went out to the warehouse and measured Curt trailer hitch # C13704 for you. The distance from the top of the mounting flanges to the top of the cross tube is 2 inches. I have included some pictures with additional measurements for you.